For weeks, I’ve been hemming and hawing about whether or not we could participate in this fall’s One Room Challenge hosted by Calling It Home. With both boys attending private school, and a tight budget, we thought we wouldn’t be able to handle an entire room. Lucky for us, I think we can do it! Time to finally tackle this neglected half bath and turn it into a Vintage Farmhouse Powder Room. This past weekend, we were straightening the garage and I stumbled upon materials leftover from previous projects and inspiration struck. I think we are going to be able to swing making over our half bath, but it will have to be under $500! Lemme show you our starting point behind this door. This is my Vintage Inspired Laundry Room that we made over for last fall’s ORC. Have you ever noticed that when I show a pic of this room that the bathroom door is ALWAYS closed? That’s because we haven’t touched the space until now! Here is what is behind that door. 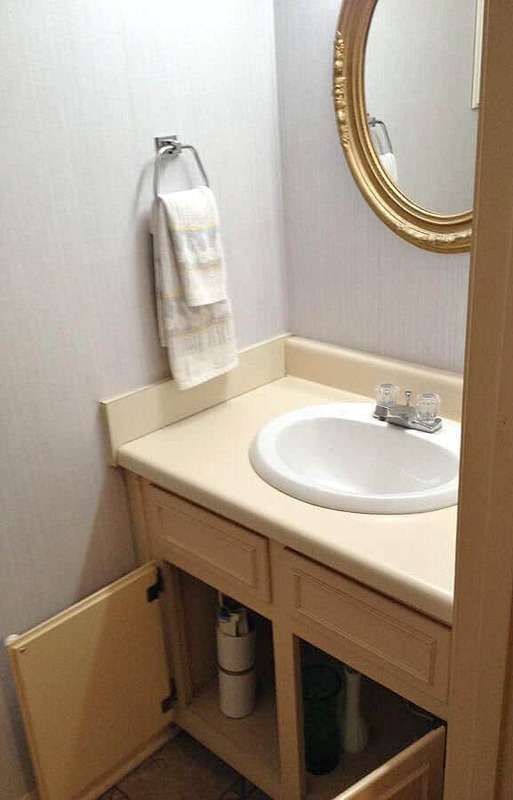 Those ugly floors and peach sink base and trim! OY! I removed the wallpaper and painted the walls with leftover paint since taking this picture, but that’s about all that has been touched in this room. We have a box of luxury vinyl tiles left over from our Kitchen floor install. First, we will install the floors using those materials to cover the last of the ugly linoleum. These next pictures are from when we first moved in – I had to use these because….those towels! I mean, come on! Next, we plan to fashion new countertops out of wood and replace the faucet. Working on limited funds means that I will reusing as much as I can. The sink basin is in great shape, but that countertop has to go. My plan is to paint the base of the cabinet the same gray color as the top cabinets of my laundry room for continuity. Also, we will add a beadboard half wall to match the laundry room and Farmhouse Kitchen, since all these rooms are connected. We found some beadboard panel remnants hiding behind some drywall during our garage cleanup, so we only need to purchase one more panel and some trim to cap it off. 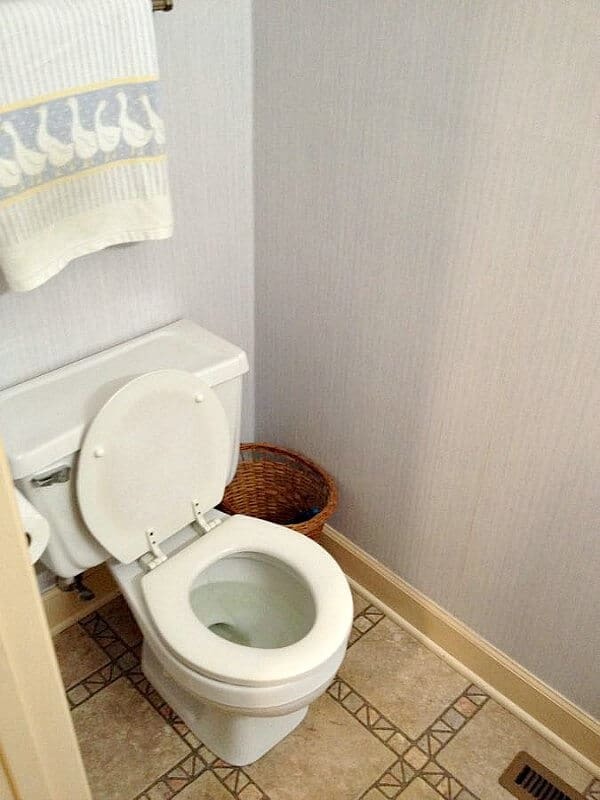 The toilet desperately needs replacing. Constantly getting stuck after flushing, we remove the lid at least 3 times a week to manually drop the plunger. 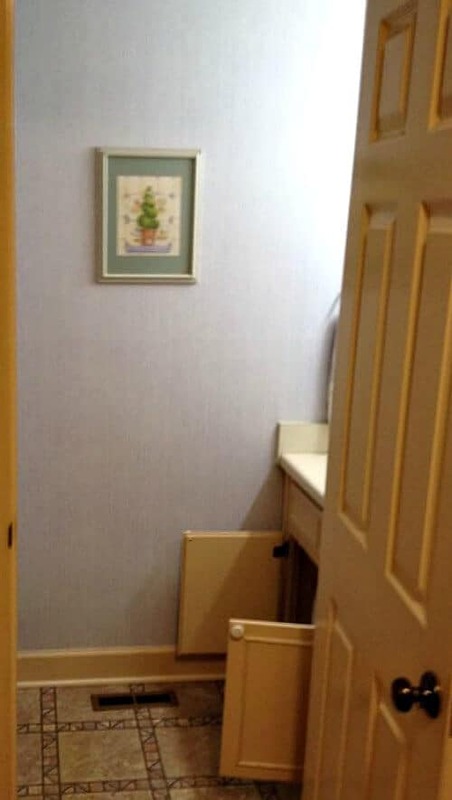 Not only that, this toilet is unusually short. In my house of tall people, everyone comments that they feel like their hugging their knees. My budget for this is about $100. Over the toilet, I plan to DIY some wood shelving with brackets. This was the light that was in the awkward half bath that we converted into a second closet this past spring for the ORC. I love the vintage frosted shade. 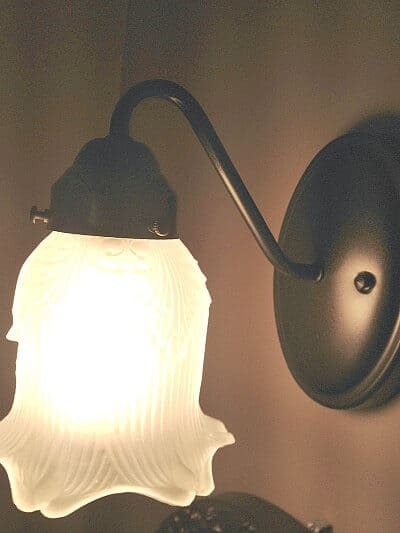 I think it will work great with the Vintage Farmhouse Powder Room theme, so we hope to reuse this fixture in this room. Finally, we have this antique medicine cabinet that came from my husband’s family. Our plan is to hang this over the sink. We simply need to add a new dowel for the missing towel rack. Hopefully I can find either some peel and stick wallpaper or some affordable fabric to create a wall treatment over the half wall. I’m hesitant to reapply wallpaper again. Since removing the old wallpaper was so tedious, I’d like it to be temporary if possible. DIY Fabric Wallpaper with starch or peel and stick wallpaper – ? Is our goal too lofty? Maybe, but I think we can make this happen. Fortunately, we have Fall break coming up, so that will free up some days for us to get in attack mode! Be sure to follow along on Instagram and Facebook where I will be sharing sneak peeks of the progress as we move along. I can’t wait to see who is participating this season. One thing I love most about this challenge is getting to know other bloggers. I find a support community helps us tackle each room! To see which rooms the other bloggers are doing, click here to head over to Calling It Home’s link up. Laura Irion/ Laura Design Co. 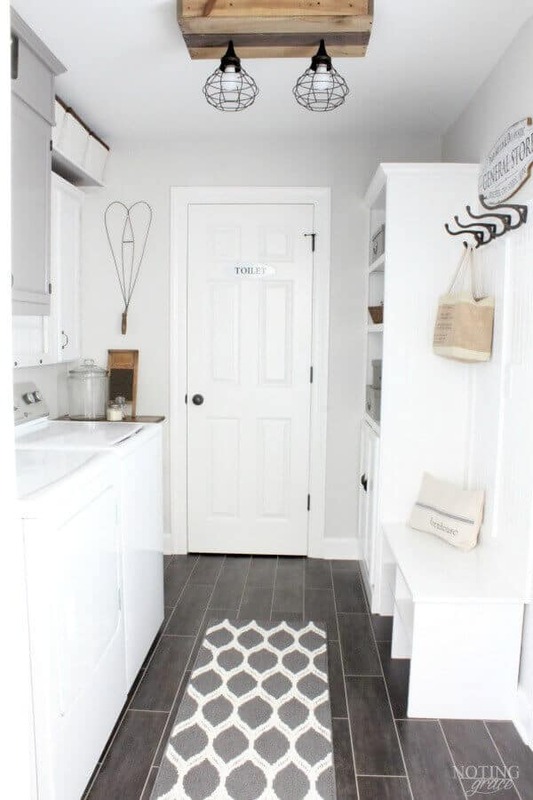 Your laundry room is so cute! Looks like the powder room will be equally cute when you’re done!! I am laughing about those towels…seriously!! Super excited to see how this turns out. I can’t wait to see what you do within your budget!! And your laundry room is so gorgeous! I love your design plan and can’t wait to follow along as you transform this space! I love all of your idea! I can’t wait to see it all come together! I love your inspiration for your bathroom! 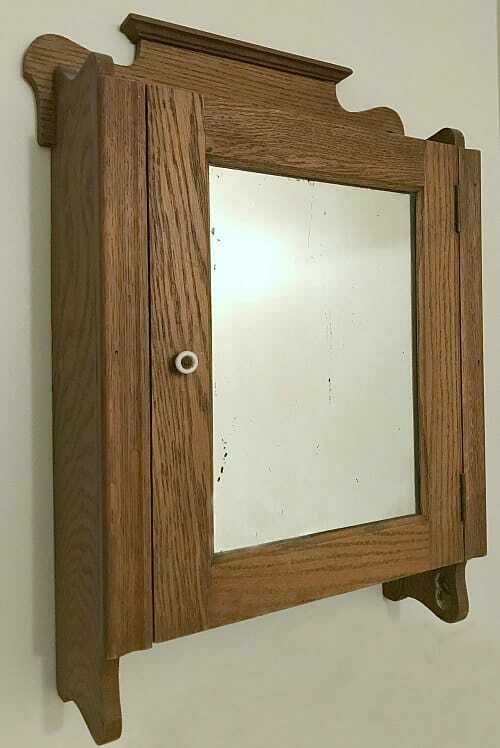 And that vintage mirror is great. You can do it!! I will be cheering you on!! I just love your laundry room and I am sure your bathroom will be stunning. I can’t wait to see it. Thank you so much Sherry! Glad to be doing this ORC with you! You are so sweet, my friend! Glad to be doing the ORC with you, my friend! Thanks Kathryn! Looking forward to seeing your kitchen! Hi Melissa! Thanks so much! I can’t wait to see the reveal either! LOL Fingers crossed it all goes well! Hi Laura! Thank you so much for taking the time to comment and giggling over those towels with me! Those were chucked on day one! So glad you are following along! This is exciting! I love the plan you have pulled together. Cannot wait to see how it comes together! 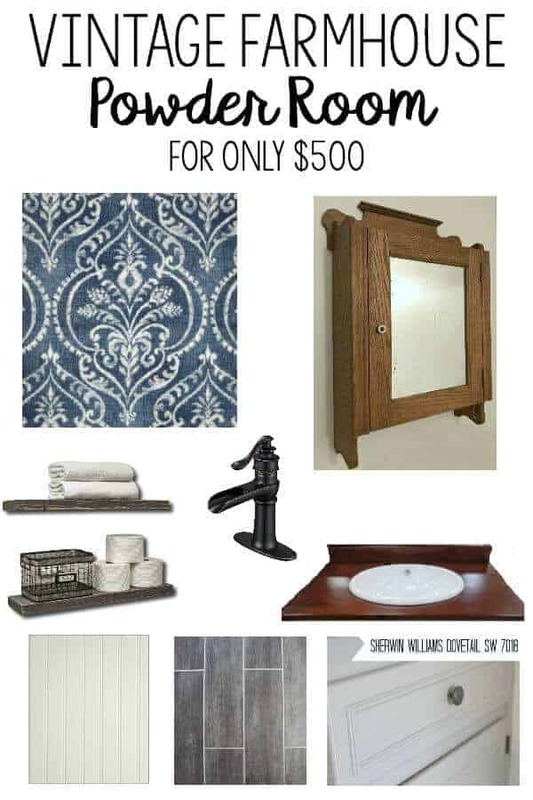 I am loving the inspiration for your bathroom and I already pinned your Mudroom ideas from the last challenge, since that is what I am doing this time! This looks like a great frugal plan! I know you’re going to make the powder room beautiful! Thanks for pinning Mary! Can’t wait to see how yours turns out! Well this is exciting! I’ve never followed along with the ORC posts before, just seen the finished results. So fun! Tara – you should totally do a ORC – it’s so much fun and super motivating!